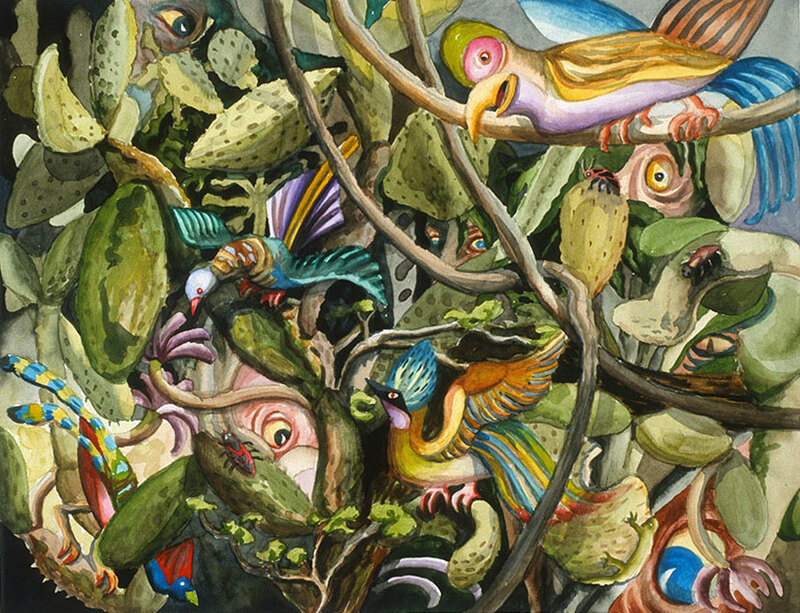 Traveling by kayak and horseback with my friend Charles Hanley to remote regions of rainforest in Mexico and Guatemala I painted the jungle as I experienced it. The natural world of those disappearing forests is a wondrous dense moist and noisy complex of plants and trees and living creatures which no painting or photograph can possibly describe. But I set forth with my watercolors, sometimes painting from the boat along the edges of pristine lagunitas, sometimes carrying my materials and a small chair to places like the ruins of Palenque and Tikal where virgin forest still exists, and sometimes by horseback through the northern regions of Peten in Mexico, and sometimes by boat to the biotopo regions along the rivers of the Rio Dulce and the Rio Sarstoon in Guatemala. 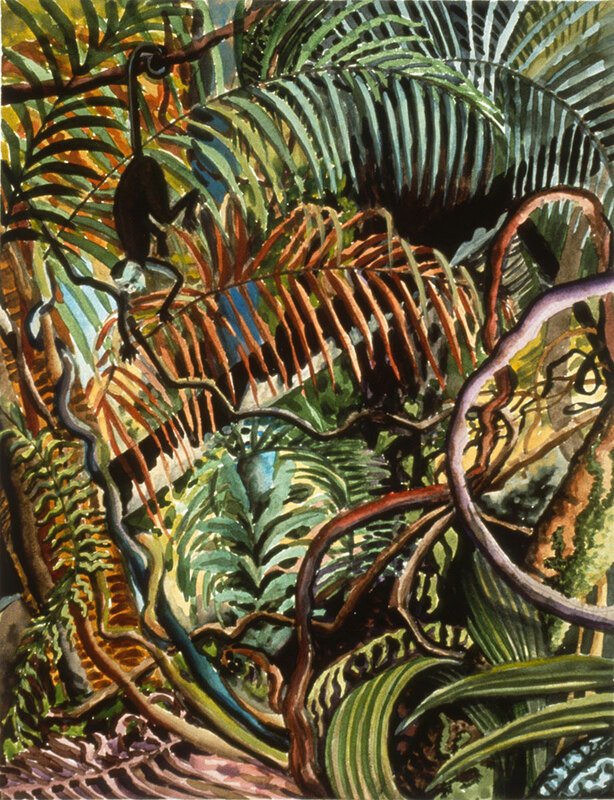 The process of painting amidst mosquitos, howler monkeys, birds and insects of a million varieties was challenging and exciting - the sounds, and breezes, and electric energy emanating from the dense forest brought me to a hyper level of seeing - creating what I could with my small box of paints. There are so many shades of green that colors like “veridian”, “hookers’ green”, and “cadmium green” seem like cartoonish shades… And so I moved to lavender, and red, and blue to capture how each tangled vine stood out from the next. Completely immersed physically I felt my heart was beating very fast in the excitement of attempting to paint that primeval world. To be literally inside of a subject, very small and of absolutely no use to my environment, created a sensation of human frailty and futility - but at the same time the experiences gave me courage and energy. 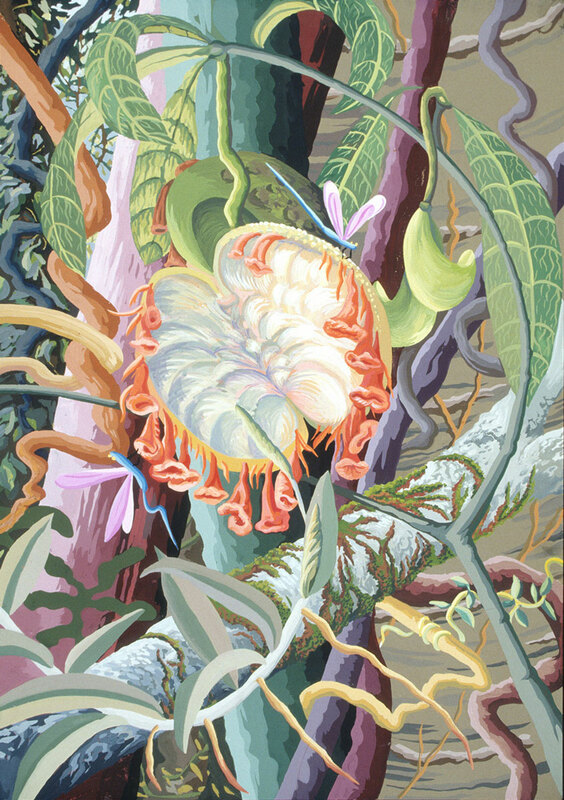 I also gained a new appreciation of those 19th century tropical botanical artists like Marianne North and Martin Heade - My work however was not about illustration. I was interested in how painting the density of the forest could lead me in creating surreal and abstract and expressive compositions. 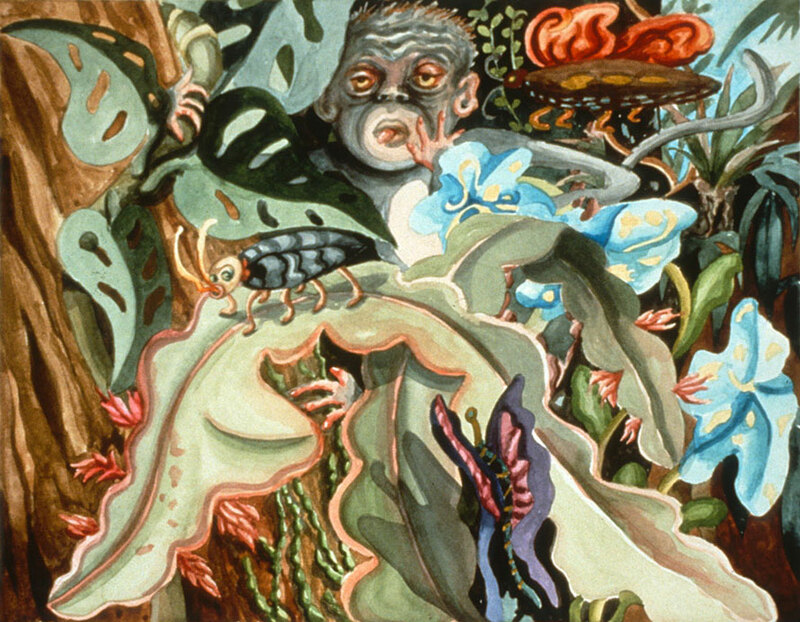 Founded on my early collage paintings and my animated films, the rainforest paintings came about through my own perception and imagination - works which could celebrate the tragedy of this disappearing paradise. "Each day we woke at dawn to make our limited rations into something edible and drink boiled “cowboy” coffee from charred metal cups. I began to make the paintings and I worked mostly from the kayak floating in the lake selecting subject matter. Tying the boat to tree limbs I carefully arranged the paints in the bottom of the boat and hanging my feet into the water, I began to work. Most of the day was spent in this position with a thermos of coffee and a rolled up bean-filled tortilla for energy. Spellbound and challenged by the utter complexity of the jungle, I stared hard at the forms, trying to discern a shape here or there I might be able to visually understand well enough to begin to paint… with so many life forms entwined and hungrily trying to reach the sun, my eyes strained hard to find a way to start. This was both frustrating and exciting… the small yellow flies were always after me, the sounds of buzzing, screeching activity surrounded me, and the rich, humid air enveloped me in constant sensation. My eyes could rest and move without limit upon green form after green form. So many shades of green… my paint box colors (an expensive professional set containing every color) seemed like a child’s set of limpid primary pans used in kindergarten. So from viridian and olive and winsor green I pushed out into yellow, violet, orange, and brown to express the millions of varieties of the color green. It never seemed enough – I was a child making small scratches to represent this overwhelming world."